Honeybee Alterations, an exhibition currently on view at the Ottawa School of Art’s Byward Market Gallery, features the artwork of Canadian artist, Aganetha Dyck. Dyck’s artistic career spans four decades and covers a variety of media, however, it is her artistic collaboration with live honeybees that has garnered her significant attention since 1991(1). This exhibition brings together several of these works from series such as Sports Night in Canada, The MMAsked Ball, and Hive Scan. The first thing I noticed in Honeybee Alterations was Hive Scan, a series of photo prints by her son Richard Dyck, a digital artist who collaborated with his mother to produce these images. Together they used a flatbed scanner in place of a camera to capture the insides of the beehives. These photographs line the walls of the gallery space and offer us a striking and thought-provoking glimpse into the collaborative process between Dyck and the honeybees. The Hive Scan series seems to exist between the realm of the abstraction and figuration, which is why they are so bewitching. The resulting prints suggest various moods – some are light, while others have a darkness to them. They show the cells of the hives, bees blurred in flight, and bees in the process of honeycomb-agglomeration. There is also an illusion of depth in the images, which she thought was unusual since most flatbed scanners produce a flattened sense of space (2).The blurred nature of the Hive Scan images lends itself well to the representation of a busy and buzzing atmosphere and evokes the ethereal landscape within the hive. In rendering the bees’ work, the Hive Scan series provides viewers with insight into how Dyck’s sculptural works are created. Dyck’s creative process is one that we do not usually encounter and she is perhaps one of only a handful of Canadian artists working with live honeybees. Dyck has said: “I decided to collaborate with honeybees the day I discovered that honeybees could dance, create audio, sculpt, solve problems and communicate” (3). She works collaboratively with the bees under the direction of beekeepers and scientists, arranging objects in an apiary and letting the bees augment them with honeycomb structures. In this way, Dyck enables the bees to act as creative decision-makers. Occasionally, Dyck will carve into the honeycomb to shape the overall aesthetic of a sculpture. Although she intervenes, she always returns the object to the apiary for the last twenty-four hours to let the bees “finish” the work. The bees are restorative creatures, so any cuts that she makes are repaired and healed. With most of the works she does not interfere with the objects and instead lets the bees make the final decision about when the project is complete (4). The final result: compelling sculptural objects that are coated with honeycomb structures and beeswax. Several of these sculptural works are displayed in the exhibition, including works from the Sports Night in Canada and The MMasked Ball series. The beeswax results from a process of accumulation and evokes the bees’ labour and the passage of time. In Shoulder Pads (1995), the bee-work is organically incorporated into the original padding of the football equipment. With Helmets (2000), the beeswax appears as if it has been dripped onto the surface causing the honeycomb structures to take on the appearance of coral. Reminiscent of objects long-lost beneath the ocean, these sculptures have a surreal quality. Aganetha Dyck, Arrival (The MMasked Ball), 2008. Beework on figurine. The Michael Gibson Gallery. Photo credit: Peter Dyck. 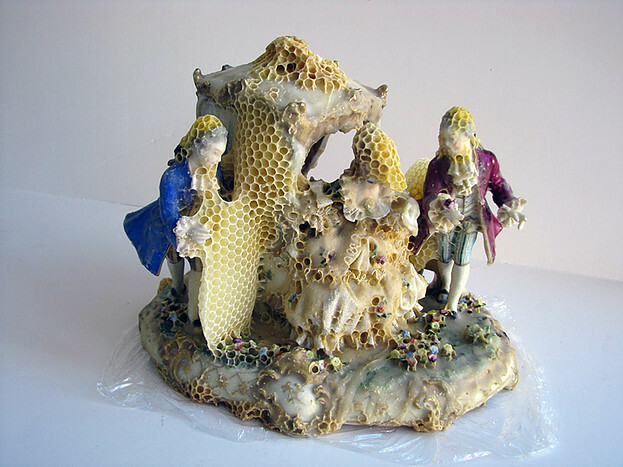 The MMasked Ball (2008) is a series that shows a number of ceramic figurines—often very kitschy figurines of figures in ball gowns and fancy dress—covered with bee-work. When asked why she works with ceramic figurines to create these collaborative bee-work sculptures, Dyck responded that she thought that they were “creepy” and that they gave her the “willies.” She thought that the bees could work their magic to make them beautiful (5). For instance, Arrival (The MMasked Ball, 2008) depicts courtiers and a fancy lady stepping out of a carriage to attend a ball. The bee-work has taken over the door of the carriage and much of the figures’ faces; the object is transformed from kitsch to art, from “creepy” to beautiful. In Dyck’s view, the bees offer redemptive and beautifying qualities to these otherwise tacky objects. There is a delicate beauty in Dyck’s artistic collaborations with the bees and with her son, Richard Dyck. Aganetha Dyck works with the bees to show their creativity and to prompt us to contemplate the intricacies of their lives, and how they relate to our world. Through these artworks we can see how manmade objects and bee-work can come together to create something beautiful. Dyck believes that our lives are intertwined with the world around us, and that we should take care of both the big and the small parts of nature that we depend upon for survival. Her work reflects these views while alluding to the environmental concerns that honeybees are currently facing. Dyck is fascinated with the power of the small and she believes that “the power of the honeybee is really [its ability] to keep the world population alive” (6). Honeybees are integral to our ecosystem; they not only produce honey, but contribute to the lifecycle of other foods that we depend on through their role as pollinators. Without them, we may face unforeseen ecological disasters and a rise in food costs. Ultimately, Honeybee Alterations expresses Aganetha Dyck’s interests in inter-species communication and the complex world of the honeybee. (2) Aganetha Dyck, “Lecture at the Ottawa School of Art,” March 6 2014. (4) Aganetha Dyck, “Lecture at the Ottawa School of Art,” March 6 2014.